Looking for a place to relax and rest, or somewhere to go for a romantic weekend? The charming guest rooms at La Parare are just the place for you. 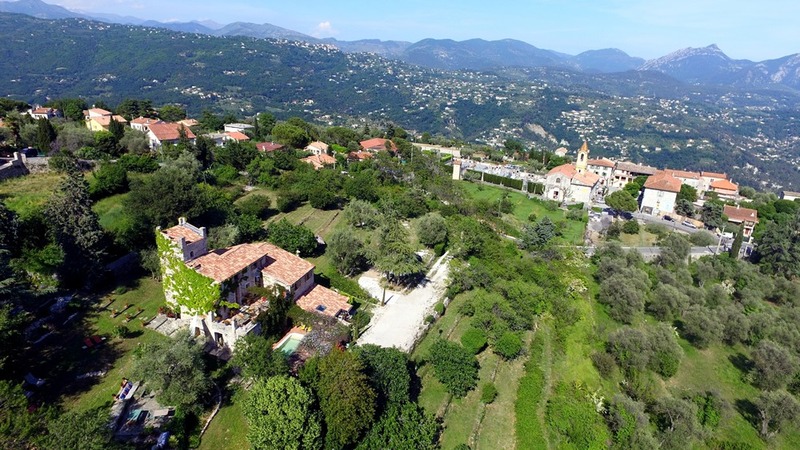 Staying at La Parare , an enchanting 17th century farmhouse located only half an hour drive from downtown Nice on the French Riviera, is like finding an extraordinary hideaway, a special place, where landscape , romance and comfort are in harmony. 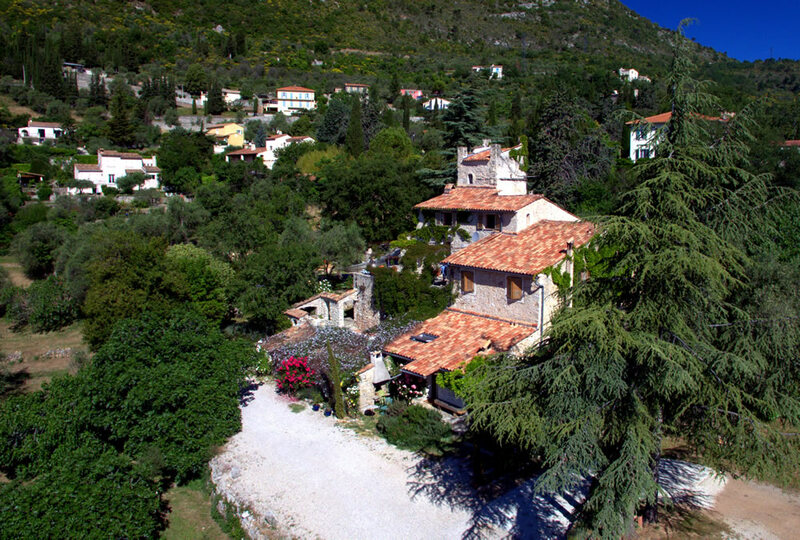 La Parare, charming B&B on the French Riviera, is about 25 minutes drive from downtown Nice & 35 minutes from Nice international airport. Karin is Swedish, Sydney is Dutch and French. Our common language is English. We manage also a bit in German. The four charming guest rooms are situated in a beautiful farmhouse surrounded by a beautiful garden. A lovely swimming pool adjoins the terrace outside the guest rooms. At La Parare there are several possibilities for well-being and relaxing activities. The French Riviera, beyond being the well-known tourist area, also has a great cultural and sport wealth. The prices are inclusive of room with breakfast, welcome drink, free access to the pool, free wireless internet access, free parking and all taxes. You can book now by filling the reservation form. La Parare is a charming, historic farmhouse that dates from the 17th century. It is built entirely of stone. For years before we found it, while we lived in Asia and travelled around the world, this was the type of property of which we both dreamed. It was love at first sight when we found it! We hope that you come to feel the way we do about La Parare and that you find what you seek, whether that is a place to just relax, to enjoy a romantic getaway, or to explore the cultural and sporting riches of our region. Thanks to our location, in the hills above Nice, La Parare offers a very quiet and soothing environment with clean air – we are at an altitude of 500 m. You will enjoy it while hiking, riding a bike, or just sitting on the terrace, enjoying the views. Staying in one of our guest rooms at La Parare means enjoying a “special” place where the landscape, romance, and comfort are in harmony. All our rooms are equipped with a private cosy sitting area, design bathroom, easy access to the terrace and a fireplace for the winter. The beauty about life is that anything can happen and anything is possible (OK – almost). If anyone had told us when we were young that we would end up running a small hotel business in the South of France, I think we would both had been surprised. Sydney less maybe so since every summer he would travel with his French mother and Dutch father from Amsterdam, where he grew up, to the French Riviera. At the time he was much more interested in sports, so much so, he started working in the tennis world. That job later served as a bridge to a job in fashion, which is what eventually took him to live and work in Hong Kong. Karin spent her first years after studying Finance in Stockholm working for different international companies, and transferred with one of them to Hong Kong where she stayed a bit longer than initially planned. This is the short version of how we met and why we speak English at home together. The longer version is better told live over a glass of wine. During our years in Asia we both travelled a lot and when the idea of setting up a B&B was presented to us, we felt that at least we understood the customer side of this business pretty well. Admittedly, we mainly travelled for work, but we still knew what we would like to find when looking for a place to spend our holidays. To renovate and decorate a big old house, which already has a lot of character is a lot of fun. Especially when you find good people to work with, as we did. The house also provided a place for pieces of art and other souvenirs we picked up on our travels and along the way to settling here. To live in Hong Kong, and some other big cities, was a lot of fun and we loved that phase of our lives, for sure. But to wake up in the morning and have that first cup of tea under the olive tree, whilst the mist is lifting from the valley – that is magic! Most of all – all the interesting people we meet! We used to travel a lot, but now the world comes to us and we love it. All the interesting discussions, getting the news of places we’ve visited and even lived in, and learning about some we have not yet seen . . . our visitors bring us those gifts and provide us inspiration for future travels. But for now, we are both very fond of our region, Sydney since childhood, and Karin now feels she has become an adopted Niçoise, after many years living here in the mountains above Nice. If you want to learn more about our region, there is a substantial collection of maps and guide books in the house, and, of course, we truly enjoy helping all our guests find what will make their holiday here special. Excellent food and wine, spectacular vistas, beautiful villages: our region has it all and we love sharing our knowledge of it with our guests. The food and wine we take especially seriously! In many ways running a B&B turned out to be pretty much what we have expected, but one aspect that came as a bonus is all the pleasure we would have from meeting all our guests – so many fascinating, friendly people! We hope the information on this page will help you enjoy your stay with us here in the countryside of the Alpes-Maritime as much as we enjoy meeting you. Sydney is both Dutch and French, and Karin is Swedish. We consider English our common language and typically use it when talking to each other. Here you can read more about us and how we found La Parare. La Parare is an old French farmhouse that has found a new mission in life as a guesthouse. The whole house is made of stone so you are not likely to hear much either of the other guests or us. We have 4 guestrooms (5 in the summer) and they are all in the same building. We have a beautiful swimming pool on the terrace and there is plenty of space around the house, so you can always find a private corner. In the summer the breakfast is served on the terrace under the olive tree and during the cooler seasons or if it’s raining we will be in the vaulted dining room in front of the open fire. La Parare is also our home and we live here all year around. Most of the furniture and decoration you see in the house comes from France, from Sweden where Karin was born and raised, and some we have picked up in Asia where we used to live for some 10 years. Most of the items have an interesting story to tell. Ask us, if you’d like. La Parare is situated about half an hour from Nice and airport and the road leading up to our village may seem a bit daunting the first time – 15 curves before you arrive. The road is well secured though and offers some beautiful views and you will soon get used to it. This road also “protects” us in the sense that there is not a lot of traffic going through the village. La Parare: so quiet and still close to the buzz of the French Cote d’Azur and all there is to see and do. Once you’ve confirmed your booking with us, we will send you a detailed confirmation containing useful information, including directions on how to find us. At any time feel free to ask us any questions you may have about the house, the region, or any practical matters, such as where to go for groceries, beach towels, and so forth. Sometimes we have guests who are experiencing a B&B for the first time. In order to help everyone feel comfortable here, we thought we’d share a bit about what it’s like to stay at La Parare and how it might be a bit different from other accommodations, such as a hotel. We do not have any staff or any staffed reception as you find in a hotel. When leaving the house we always forward our main phone number to our mobile number, so you may occasionally call us and catch us while we are out working in the garden or running errands, but we are available. We do check e-mail on a regular basis so feel free to leave a message there. Since we do not have a staffed reception, our check-in timeframe is very important to us and you. Arrival time is between 16h (4 PM) and 19h (7 PM) unless we have agreed on a different hour. If your plans have changed from the arrival time that you originally communicated to us, please let us know as soon as you can so we can modify our schedules to accommodate you. Normally, so long as we know in advance, it’s not a problem. Once you are checked in, you can treat La Parare like it’s your home away from home. Don’t worry about staying out late, there are no expectations here! If there are other guests, please be mindful of that if you are coming home late. Each room has a key so that you can lock it when you head out and the lights will be on. At night we are obliged to close off the entrance road with an electric fence against the wild boars that live in the region and occasionally come by. It’s easy to open the fence. Just take the green plastic handles, then pull them open to get the car through. Please close the fence after the car is through! The wild boars are harmless and will avoid any contact with humans, but can cause a lot of damage in the garden if left to it. Caring for the environment is very important to us and we hope you will join us in this quest. We try to live the philosophy that life should be enjoyed, but not at the expense of the environment. With that idea in mind, your sheets and towels will be changed every 4-5 days and, weather-permitting, we hang our laundry on clotheslines up the hill, out of view of guests. You will find the tap water perfectly acceptable for drinking. We choose cleaning products that are environmentally-friendly, we recycle as much as possible, and try to watch our consumption of fuels for heating and lighting, keeping in mind the comfort of our guests, of course. La Parare is an old stone building and is not suitable for small children, or anyone with walking difficulties, unfortunately. The house has steep stairs, some low barriers around the terrace and some of the rooms have different levels, for example, stairs that lead to the bathroom or the living area. All of this add to the charm of our home, but it also poses dangers for children or a parent carrying their baby in their arms. In addition, the pool, all stone, and not suitable for jumping, playing games, or diving. In short, the house is not suitable for children below 12 years, for those with walking disabilities, in some cases, or the elderly. We want all our guests to enjoy themselves, to be comfortable, and safe. We both think that breakfast is very important and when you are on holiday, it is the best meal of the day. Breakfast will be ready starting at 8h30. If you must depart early, let us know as soon as possible and we will try to put together something for you. When you sit down to breakfast at La Parare we will serve you a lovely variety of mostly home-made breads and cakes, jams and marmalade, fresh fruit, freshly squeezed orange juice, yogurts, and our own muesli. There will be boiled eggs, cheese and ham, and every day a little treat at the end. Think of it as breakfast dessert! There is a choice of tea (green or black – no tea bags) and we buy Italian roast coffee, freshly ground in a coffee shop in old Nice. We prepare it using the French press method, or if you prefer an expresso that is also available. You will find a kettle in your room for a pre-breakfast tea or coffee. If you have a food allergy or medical condition that requires you avoid certain foods, such as gluten or lactose intolerance, please let us know when you make your reservation and we will try to find good substitutes. We always try to be flexible; however, bear in mind that there is no staff and everything is done by us, your two hosts. Please let us know beforehand of any special requirements and we will do our best to ensure you will have an enjoyable time with us at La Parare. We do “table d’hotes” (dinner with a set menu that we all eat together) about once a week. 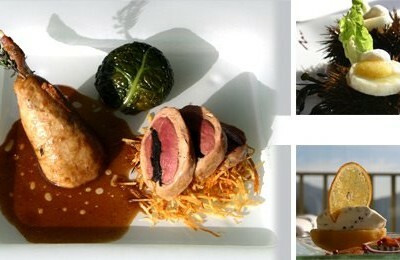 There are no fixed days and we plan these dinners according to demand and the guests staying at La Parare. We need a minimum of 6 people and we try to ensure that it works out, language-wise, so that everybody will have a good time. There is one restaurant in the village, Chez Rose, and several in Contes, down the hills, less than a 10 minutes drive, and a large number to choose from in the region. We have a restaurant list that we keep updated with restaurants that we have tried and recommend, and we are happy to discuss the various options available. We can also help you to make reservations. If you decide that you do not want to go out for dinner, you can go to the small village store and get a take-away pizza. If you get hungry after he has closed for the day, it’s still possible to call the pizza place in Contes that stays open until 21h30. They will deliver. We also keep some ready-made dishes in the freezer, so don’t worry. At La Parare you will never starve! We have an honesty bar in the garden bird-house with fridges where you can store your own food. It is also stocked with plates, glasses, cutlery, and all you need to organize a picnic or a light meal. There is a fridge with a variety of drinks for sale, a coffee machine and a microwave. Book directly with us and get the best price!